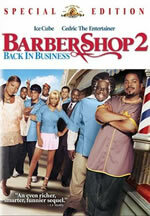 Though the first Barbershop wasn't exactly crying out for a sequel, it was a mild success and a follow-up was inevitable. But it's not entirely unwelcome, unlike something like Tomb Raider, due to the chemistry among the characters and Ice Cube's admittedly ample charisma. Unfortunately, the film also apes the original's penchant for useless subplots; only this time around, there's more of them. For a while, though, the movie is just as enjoyable as the first one - particularly during the scenes set within the barbershop. It's the aimless chatter among employees - including Calvin (Cube), Eddie (Cedric the Entertainer), and Isaac (Troy Garity) - that are the film's most engaging, as screenwriter (Don Scott, who also worked on the original) does a nice job of giving their conversations an honest, real feeling. The plot kicks in when Nappy Cuts, a franchise that's evidently the black version of SuperCuts, decides to open shop right across from Calvin's store. As if that wasn't bad enough for Calvin, the would-be proprietor of said Nappy Cuts is in cahoots with a shady alderman (they want to turn the entire block into a series of commercial enterprises, ie Blockbuster). This leads to a horrendously misguided sequence in which Calvin has to stand before a board and plead for them to keep the neighborhood the way it is. There are other needless subplots, too, which the film struggles to wrap up as the conclusion draws near (stretching the running time to almost two hours as a result). Perhaps if the movie had been funnier, it would've been easier to overlook the bizarre dramatic interludes - but it's not (to be fair, there are a few genuinely humorous moments). Audio: Barbershop 2 is presented with a DD 5.1 soundtrack, and it’s surprisingly effective. This is especially evident in the opening moments of the film, with the character of Eddie on the run from the police. Surround effects are prominent here, and though the majority of the movie is dialogue based, it often feels as though you’re sitting in that barbershop (voices seem to emerge from all around the room). Video: This 1.85:1 transfer is also quite good, and looks incredibly clean and crisp. Not much else to say except that it’s another stellar effort from MGM. Extras: This special edition comes with a fair amount of supplemental content, though there’s not a single behind-the-scenes featurette to be found (an odd exclusion, to be sure). Still, the two commentary tracks will probably tell you everything you want to know about the making of the movie. The first – featuring director Kevin Sullivan, and producers Rovert Teitel and George Tillman Jr. – is the more informative track, with Sullivan and co. divulging a number of intriguing tidbits. The second – with cast members Cedric the Entertainer, Sean Patrick Thomas, Troy Garrity, and Jazsmin Lewis – is probably more enjoyable than the first, though it does suffer from quite a few quiet periods. This track is also accompanied by a small video box of the participants that occasionally pops up. The disc also includes six deleted scenes, six minutes of outtake footage, two photo galleries, and music videos for Mary J. Blige and Eve’s “Not Today” and Sleepy Brown and Outkast’s “I Can’t Wait.” Finally, the disc comes with several trailers (Barbershop 1 & 2, Out of Time, Dark Blue, and Bulletproof Monk).